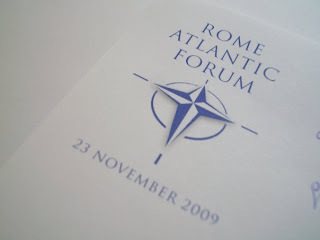 ‘NATO New Strategic Concept and The Future of Transatlantic Relations’, held in Rome November 23rd 2009. The Conference was divided in two parts (morning and afternoon) and aimed to promote the discussion on the challenge that represents the drafting of a NATO New Strategic Concept, as well as the relations between the two shores of the North Atlantic region[i]. During the morning several speakers shared their opinions, suggestions and comments on what should be included in the new NATO Strategic Concept. For that matter one of the most repeated idea was the importance of knowing what is today’s NATO’s, and what is its purpose regarding a new strategic environment, both internal and external. In fact environmental scanning is the first phase of the strategic process of drafting a strategic concept that both emphasizes the strengths of the organization, knowing its weaknesses, and, thus, allows it to take advantage of the opportunities and minimize potential threats that other actors might constitute to its existence and activity. One of the factors identified has having gained weight in comparison with the former process of drafting the NATO’s strategic concept is public opinion. In fact the importance of civil society was emphasized by most of the speakers who underlined the importance of the legitimacy of governments’ decisions, particularly regarding the deployment of national troops into war/conflict scenarios. The importance of civil society is not only related with the support or not that it might give to the organization’s actions. Indeed there is a new understanding of what security means which has implications in the interpretation of one of the NATO’s bedrocks: Article 5. Article 5 of the Washington Treaty was also highly discussed. Although its existence and importance were not questioned, many argue that its meaning has changed. Defense has overcome a geographical meaning and became more “individualized”. States have not only the need to protect its territory but also their citizens. That fact changed the type and scope of interventions, and some say the very nature of war. What is exactly an ‘armed attack’? How preventive and out of area can NATO go? How can NATO remain effective as a political-military organization in a ‘world with no borders’, in a new strategic environment? These are some of the questions that defy the geographical feature and a restrictive interpretation of the nature of the action that triggers Alliance’s actions. Hence, and regarding the changed and changing strategic environment, what should be NATO’s role in terms of its capabilities and operations? The scope of NATO’s actions is, thus, highly debatable. Indeed, Ambassador Aragona (Member of the NATO Group of Experts on the New Strategic Concept) emphasized the non-traditional feature of international security and international threats, which lead to the need of the maintenance and revision of the comprehensive approach. Nonetheless, NATO shall avoid become a global police. Instead the solution might be a more effective interlocking with other actors which will allow NATO to act globally, protecting its interests and pursuing its objectives without becoming too wide and, potentially, void. The danger of ‘acting global’ is precisely the lack of capabilities, but also of political will to do so. No speaker supported a global NATO (in scope and action). Nevertheless a better balance between article 5 and 4 of the Washington Treaty should assure a better approach to new threats and conflicts, which is then complemented by a multilateral dimension based on cooperation with other international actors. Very succinctly Dr. Stephen Flanagan (Director of International Security Program) divided the issue of the new Strategic Concept in two dimensions. First it shall be determined the very own need of a new strategic concept; and secondly the type of threats it should address. The fact that threats reflect “the dark side of globalization” – as said by Dr. Karl-Heinz Camp (Director of the NATO Defense College Research Division) - leads to the need of NATO to redefine itself as a collective defense organization. Thus, and again, the linkage between article 4 and 5 is needed in order to respond to a ‘continuum of security’. For this matter the speaker underlined the importance of creating a more effective consultation mechanism between the member states that covers essentially crisis prevention, crisis management and defense response issues. The balance between the political and military components of NATO should be met, and, more importantly, NATO should define both its structure (eg: decision-making process; consultation mechanisms) but also its capabilities, meaning both its decision and executive/operational dimensions. Indeed the mission, objectives and plans and policies are defined by the political leaders, but they have to be adequate, acceptable and attainable at a more operational level, by the military. For this reason the formulation phase of the drafting of a new strategic concept must identify in a clear way the objectives of the Alliance, prioritize them, and make them commonly accepted and supported objectives of the North Atlantic community. How can a growing Alliance accommodate the individual interests, objectives and threat perceptions of its members? How can the definition of a new Strategic Concept through the lowest common denominator make NATO a credible actor? Nevertheless, the debate on the diversity of NATO member states is not only related to threat perceptions. Indeed an issue that greatly influences the performance and credibility of the Alliance is burden sharing, whose importance was argued by most of speakers, but particularly by General Vincenzo Camporini (Chief of the Italian Defense Staff). Indeed, General Camporini argued for the importance of the solidarity between member states, as it is crucial to the success of the operations on the ground, and thus affects NATO’s success and effectiveness. The way pointed out by General Camporini to get over the budget issue is the integration of common capabilities, either by specialization of countries or by leadership of one coordinator. Thus, the financial dimension is also to be taken into account when formulating a strategic concept, as it will be one of the proofs that will validate (or not) the formulation phase. One of great challenges that was continuously mentioned is Afghanistan. The outcome of NATO’s involvement in this theatre has a crucial importance for the credibility of the Alliance as a remaining pillar of international security. For this matter it is important to evaluate the situation and consider the lessons learned, but also be simultaneously cautious and ambitious in what concerns the involvement in other operations. In fact Afghanistan and the Lisbon Summit to be held in the end of 2010 will be the two theaters where NATO has to prove that it still is an important and effective organization. In these two places both the formulation and operationalization of a new strategic concept will have a major importance not only to the allies but also to the image of NATO and its position in the strategic environment. Besides the debate on the diversity of perspectives about what is and should NATO be (that might turn out in a disappointing and rapidly inadequate strategic concept), the external environment, namely partnerships, Russia, BRIC countries, and also the EU seem to be points of disagreement between the member states. Thus, the strategic position that NATO wants to assume might not be all that clear about with whom to cooperate and in what way. To sum up, the first part of the debate was very fruitful and diverse. There was great agreement on the changing nature of threats, namely to include climate change, energy security, outer space, maritime security and the proliferation of nuclear weapons. Nonetheless each speaker, due to its functions or origins, offered different interpretations, comments and suggestions as to the strategy NATO as to engage in the post 9/11 world. The main convergence was around the fact that NATO remains a pillar of international security. The guarantee of NATO’s adaptation to a new strategic environment is thus crucial to international peace and security. Yet the way to get there might be difficult to find, and there is great danger that the lack of ambition of the Alliance’s member states in giving NATO the capabilities to act leads to an excessively flexible (or even loose) strategic concept. The Mars vs Venus debate, i.e. USA-EU security approaches, was addressed in a more detailed manner in the afternoon session of the conference where it was debated ‘The Future of Transatlantic Relations’. In this context the main actors referred were the USA, the EU, Russia, and the BRIC emerging powers. In what concerns the USA, some speakers mentioned the potential increase of cooperation promoted by the Obama’s administration, which strengthens the multilateral approach of the new NATO strategic concept. The danger though, is the fact that the epicenter of American foreign policy might now be dislocated to the Pacific, rather than the Atlantic. US foreign policy is of major importance for the definition of NATO’s attitude and policy, once the USA is the major contributor for NATO’s budget. Therefore, one has to acknowledge that unless this trend is reversed, that fact still grants the USA great leverage and legitimacy to set the Alliance’s agenda. As for the EU, the definition of a clearer ESPD and the implementation of the changes brought by the Lisbon Treaty cause some skepticism or, to say the least, precaution as to if the EU wants to share the burden and assume (together with the USA) the transatlantic leadership in a more effective way. The search for a balance between the two shores of the Atlantic is crucial for the effectiveness of NATO. Europe has given a positive sign in terms of its participation in a more operational phase, namely with the reintegration of France in NATO’s military structure. Nonetheless there is a need to show political will to solve some issues that might weaken Europe, particularly the EU (e.g. Cyprus and Turkey issues), and commitment in what concerns the budget and the deployment of troops to NATO missions. Ambassador Di Benisichi (Vice President of the Italian Atlantic Committee) mentioned three main issues in the relation between the USA and the EU: political commitment and attitude towards defense; structural differences (institutional framework); and at the operational level, the risk of duplication. There is indeed a need to “update political ties”, as said by Min. Plen. Sandro de Bernardin (Vice Secretary General of the Italian Minister of Foreign Affairs). At the same time there are other actors that need to be taken into account in the new Strategic Concept. Russia is one important actor to be considered in the environmental scanning, but also to the definition of objectives and posture of NATO. In fact Russia triggers both internal and external issues that might weaken NATO. On the one hand Russia is an important player when defining an enlargement strategy and policy (the sensivity of the ‘near abroad’), on the other hand the posture of NATO towards Russia as an external actor which can confront NATO by threatening the accomplishment of the Alliance’s objectives, or contrarily be engaged in a strategic partnership to guarantee a broader concept of North Atlantic security. One way or another, Russia has to be considered and included in NATO’s strategic calculation and, therefore, in the new strategic concept. A clear example of the importance of the improvement of NATO-Russia’s relations is the Non-Proliferation Treaty, and thus, the ability to reduce nuclear as a growing threat to international security, which can only be met if involving both actors. Of course this is not an easy-to-solve issue. Convergence (or to say the least cooperation) seems difficult (but attainable). NATO has now 28 member states, and its most recent members came from the East Europe, their history of confrontation and oppression are still fresh in these nation-states’ memories. Russia-NATO relations seem, thus, a delicate issue, yet one that cannot be avoided if member states want to establish a clear strategy, and an effective NATO. BRIC countries were also mentioned as actors which should be taken into account. This is so as it was strongly argued that NATO should seek global partnerships to make more effective and credible its actions, but also to deter possible threats. Non-state actors were mentioned by Mr. Marco Vicenzino (Executive Director of the Global Strategy Project) as other aspect that might influence the future of transatlantic relations due to the importance of civil society for the success of NATO’s strategic concept. The belief that NATO is and will continue to be an essential actor in the international security architecture was reinforced by this conference. Thus the exchange of ideas and values which allow that fact continues to be one of the most positive aspects national ATA’s and YATA’s generate, through the mobilization of civil society for the debate on the new strategic concept. [i] The discussion was based on a discussion paper proposed by the Italian Atlantic Committee (Strategic Concept Working Group).